Last week, @Evleaks stated that Motorola was set to offer its Moto X customization tool for T-Mobile subscribers from Friday, November 8th. The weekend came and went with as much as a whisper of it going online. 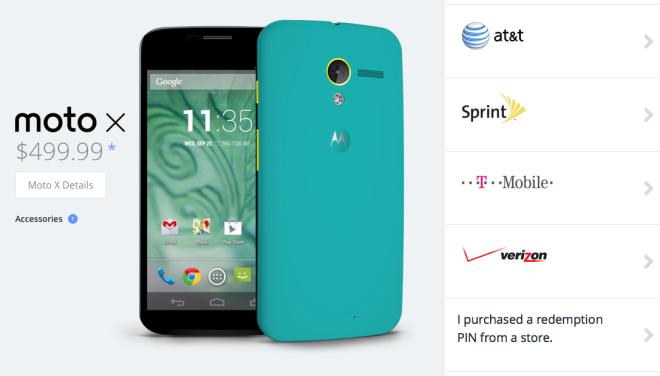 Thankfully, the wait is over and you can now head on over to the Motorola Moto Maker and order a Moto X to suit your own style for use on T-Mobile US. Moto Maker will allow you to choose your own color back panel as well as accents (buttons and ring around camera lens) as well as choose between white and black for the front panel. Cost is $499 contract-free. From having a quick check through the checkout process, there’s seemingly no option to sign up for a T-Mobile EIP, so it’s more than likely a case of stumping up the cash and sticking in your own SIM. If any of you customize and purchase one, be sure to let us know what the process is like, and if you faced any complications. ← What was your first T-Mobile phone? Just ordered mine. Decked it out for the OKC Thunder! I’m right there with you. I have the Nexus 4 and I’m hoping KitKat will satisfy my urges. I think I’m going to snag a T-Mobile LTE hotspot for cheap and hold out til next year. We should have some curved glass to choose from by then and maybe a Moto X 2? Dang it. I was hoping for wood! How much longer!? On a serious note: I’ve been waiting for some news on the wood being available too. But that’s a question of blood flow…. I’m assuming this is only for the 16GB version? I went through the process, and didn’t see any way to order the 32GB version for TMO… or did I miss it? Never mind: I totally missed it and it’s there. A minute late and a buck short for me. iPhone 5 in hand. How many phones are these manufacturers going to produce? This is all getting ridiculous! I’ll continue sticking with my flawless iPhone. At least one company has it going right for them. Everyone else is just beating their heads against the wall. Um No, Why do you think other companies are beating their head against a wall? Im plenty happy with my superior HTC One Thank you! It’s just too bad that your phone is not running on iOS 7. Have fun with your tooth pick slim 4″ screen and only able to surf pages in mobile versions only because of the non flash pathetic Safari browser design they offer . I’ll take my Nokia 925 WP8 over that any day with real web browsing and with better ppi and 4.5″ normal screen . Whiskers pointed out some of the advantages of WP8 – windows phone 8. Android was not mentioned once. Thank you for your opinion, but please read comments before bashing. P.S. Not all droids are the same or called droids. Our apps are improving and we have some hardware that rivals/overtakes that of the iphone depending on who you talk to. Some of these people aren’t even fans of android. Your absolutely correct. I should have stated that I personally owned a Windows Mobile phone and like Android, I couldn’t navigate through the phone. Windows Mobile touch screen came way too late to the party and Windows apps are really useless. Bill Gates should have listen to Steve Jobs back in 2007 and realized where the technology was going with smartphones and tablets and should have developed better apps for the consumer. P.S. I’m only stating my opinion so don’t take anything I say personal. I know there is a lot of passion on both sides of the spectrum. You are right about it being a personal opinion as it is not about “penny pinching”. I actually have an iPhone 4 sitting in a drawer (I just use it to test websites for my job). I totally see how some people would like it, but I just find it incredibly boring to use and after the iOS 7 update it looks like a cheap toy (sorry pastels are not my color). I will admit that many Android phones are kind of crappy, but I love my HTC One. As far as being bothered by the number of phones manufacturers are making…why should that matter? If you and I have our phones and totally happy, why should it matter to us if other people have something else that they like? That would be like me getting upset that Tesla is announcing a new model even though I totally love my pick-up truck. does the moto have a better camera than the nexus5? Regardless of price, do people here think the nexus 5 is much better than the moto? Moto x, or n5? Or is there another moto coming out soon? The Moto G which is a low budget phone. Otherwise I doubt it since they released a whole bunch of phones 3 months ago. Yeah, Moto G. But like @psychoace:disqus said, it’s a budget model. It’s not the sequel to the Moto X by any stretch of the imagination. Can somebody please kick T-Mo in the @ss and let us get this on an EIP. I know, right. I’m guessing this has more to do with Motorola’s restricting than Tmo’s desire to carry it. AT&T has a card you can buy on Contract to then plug into the Motomaker site and get your phone. T-mo just needs to do the same thing for their EIP. It doesn’t seem like this would be hard considering the mechanism is already in place for AT&T. How many of you are planning on ordering it with the “Raspberry” back? Closest thing to magenta on there. When can I can wood backs?